The homey flavors of chestnut and cream evoke the comfort of Aunt May&apos;s kitchen while the vibrant tang of ceylon and cherries pay homage to a life of adventure and derring-do. A dash of cornflowers and rose petals comes swinging in like a summer breeze caught while web-slinging over the city (okay so we all know NYC doesn&apos;t ever smell that sweet, but nobody would actually want to drink what those streets smell like!). 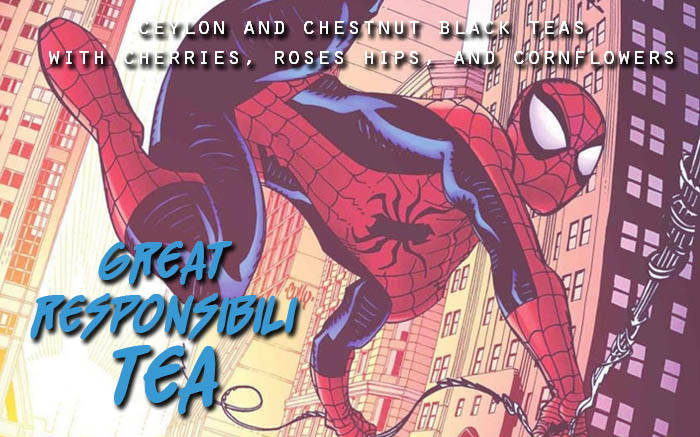 This tea weighs the grounding influence of black tea and responsibility against the sprightly spring of light fruit and florals in classic cherry red and cornflower blue -- because as no one knows better than your friendly neighborhood Peter Parker, with great tea must come great responsibility! 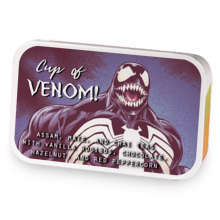 Cup of Great ResponsibiliTEA has hooked up with Cup of Venom. Love Cup of Great ResponsibiliTEA? This is just one of 4 teas in this fandom. Check out the whole series.